Originally, Suomenlinna was equipped with several gunpowder magazines for protecting the gunpowder from moisture and enemy fire. One of the two remaining magazines has been transformed into a banquet facility. Please note! The toilet facilities are located in a separate building. The facility is closed from January to March. Venue is not suitable for people with mobility difficulties. The Gunpowder Magazine has no windows and is the perfect place to enjoy parties and meetings without the constant ringing of cell phones, as they do not work in the facility due to the thick earth roof. The entrance to the hall is through an old, narrow defence passage. The other defence passage hosts a small kitchen. The hall itself is a tall, brick-built barrel vault. Technical and electrical connections were installed under the planching during the renovation work. During the Gustavian period, three large gunpowder magazines were built in Suomenlinna. The Susisaari gunpowder magazine, built in 1776–1778, is one of the two remaining gunpowder magazines. The large vaulted openings at the ends of the Susisaari gunpowder magazine have been bricked up. The architecture from the Swedish period can still be seen in the interior: the grand, barrel-vaulted room is encircled by a low, vaulted defence passage equipped with embrasures for rifles. The only entrance to the inner part of the magazine was through the surrounding passage, from the southern end of the building. The walls and vaults were equipped with a skilfully made ventilation system to keep the gunpowder dry. The roof structures were destroyed in a fire caused by the bombardments during the Crimean War. In 1878, the magazine was completely covered in huge layers of earth and dirt, leaving only the north-eastern façade visible. 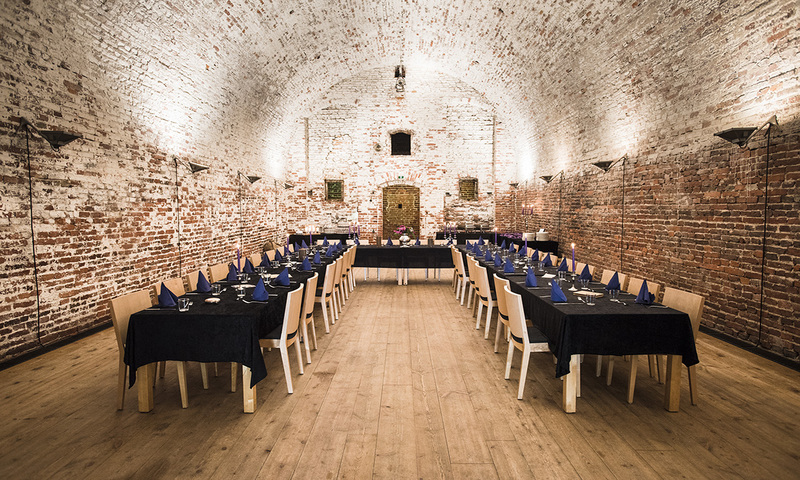 During the Finnish period, the gunpowder magazine was used as a storage space and a potato cellar. A door opening was made in the inner wall of the magazine end. In 1999, the gunpowder magazine was renovated for use as a conference and banquet facility.